Ace your DNA transfection in the cell model you need! As Transfection Experts, we know that it is essential for biologists to work with physiologically relevant cell models. For gene expression studies, transfection is the preferred technique to introduce a gene of interest in a given cell model, due to its cost-effectiveness and simplicity-of-use in comparison to physical techniques (e.g. micro-injection, electroporation). Several types of cells (primary cells, stem cells or cancer cell lines) remain difficult to transfect with DNA for different reasons: slow-dividing rates, cell fragility and cellular defense mechanisms. 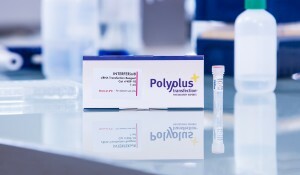 To address the current limits of DNA transfection and complement our existing gene expression portfolio (jetPEI®, jetPRIME®, jetMESSENGER®), Polyplus-transfection® engineered an innovative delivery nanoparticle: jetOPTIMUS®. Bulk quantities are available upon request. Please contact us. jetOPTIMUS® is an innovative cationic nanotechnology developed to improve DNA transfection efficiency in easy- and difficult-to-transfect cells used as in vitro cell culture models. Tested on various primary cells and cell lines, jetOPTIMUS® proved its superiority by reaching higher transfection efficiencies and gene expression than main competitors. Fig. 1: jetOPTIMUS® outperforms its main competitor. Transfection efficiency was assessed by FACS analysis in various cell lines 24 h after transfection with a plasmid coding for a GFP protein in 24-well plates. Conditions were set up according to the manufacturer’s recommendations both for Lipofectamine® 3000 and for jetOPTIMUS®. Advanced nanotechnology: Superior gene expression using less material! jetOPTIMUS® has been developed to increase transfection efficiency into a wide range of cell types, while keeping the amount of DNA as low as possible, and reducing the volume of reagent required compared to main competitors. Consequently, scientists can increase the number of transfections and reduce the cost per reaction by up to seven-fold (table 1). 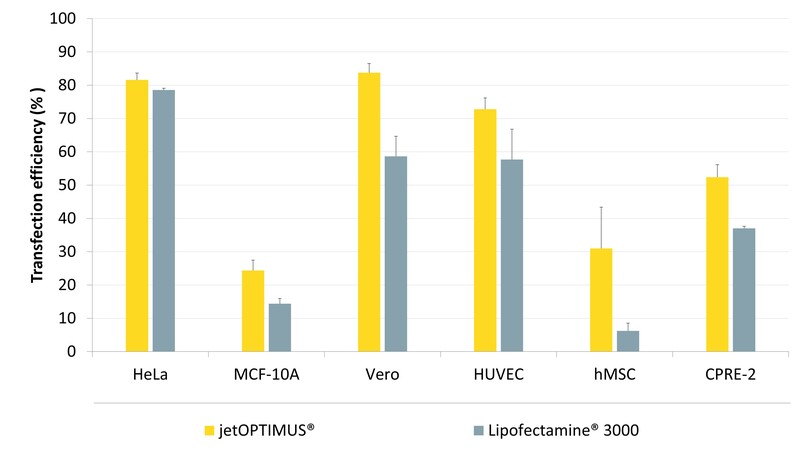 Table 1: Lower volume of jetOPTIMUS® is required compared to Lipofectamine® 3000 in 24-well plate. Reaching high transfection efficiencies is often at the expense of cellular integrity, with adverse effects on cell cycle, metabolism and signaling pathways. 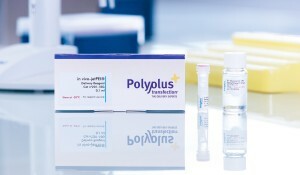 At Polyplus-transfection, we make no compromise on cell integrity: jetOPTIMUS® transfection reagent is gentle on cells, allowing generation of biologically relevant data from gene expression studies. Fig. 2: Cells remains healthy and keep a good morphology 24h after transfection. Phase contrast microscopy of both MDCK and VERO cells 24 h after transfections with a plasmid coding for a GFP protein performed according to the manufacturer’s recommendations for each reagent. 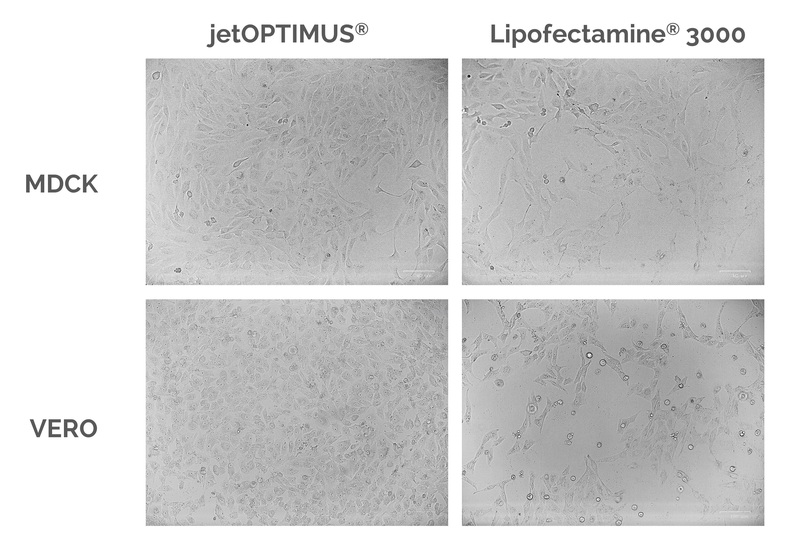 jetOPTIMUS® is a ready-to-use transfection reagent provided with its own complexation buffer (jetOPTIMUS® Buffer). The protocol is optimized for simplicity of use (all plate sizes), culture medium compatibility (antibiotics, serum) and cost-effectiveness (lowest amount of DNA and volume of reagent). Fig. 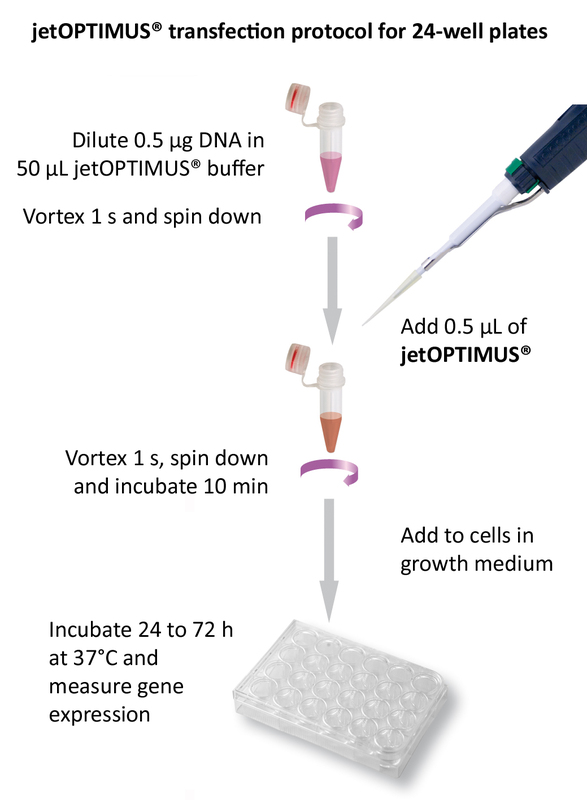 3: Simplicity of the jetOPTIMUS® protocol for DNA transfection, here in 24-well plates. 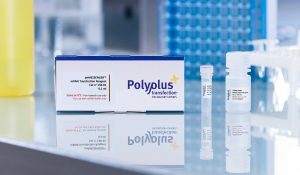 If you have any questions regarding jetOPTIMUS® please visit our dedicated Frequently asked questions or contact us at support@polyplus-transfection.com. Each lot of jetOPTIMUS® is tested in-house by DNA transfection in HeLa cells following standard protocol. Every batch will be provided with Certificate of Analysis.